Oh Hey There! 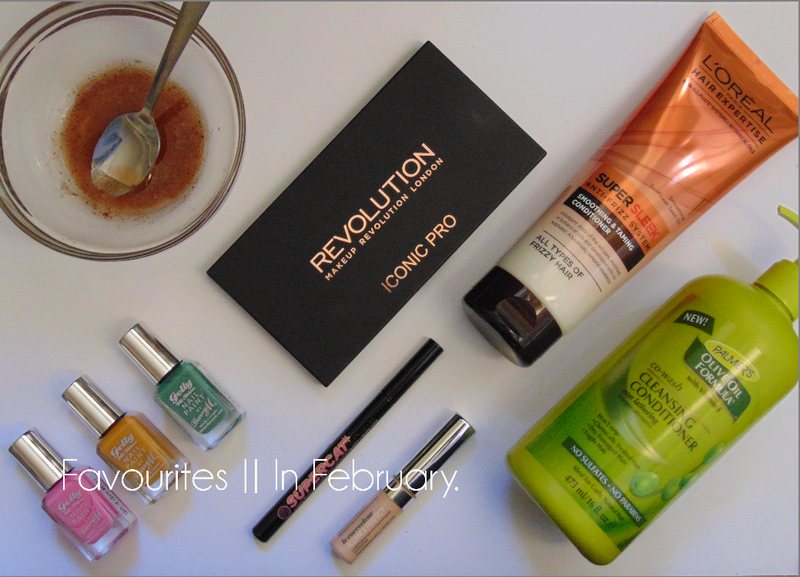 : Favourites || In February! In terms of makeup my first favourite is the Soap and Glory Supercat Eyeliner. I have heard nothing but good things about this product and I know it is a favourite of many so I thought I would finally give it a go! It created a nice smooth line, the applicator is a great shape and it lasts really well. If you are someone like me who is always struggling with liners this is the one for you! Another eye product I have been loving is the Makeup Revolution Iconic Pro 1 aka the 'LORAC Pro Dupe Palette'. I have a review of coming shortly so I won't say too much, but I will say that the shades are great, the colours pigmented and easy to work with. It also comes with a great quality, amazing double ended brush. My most used favourite definetly is the Loreal True Match Concealer in Vanilla. I have been using this for about a year, yet, bizarrely it has never made it into my favourites. The only time it leaves my handbag is to apply it. It gives great coverage, blends really well and is a great all rounder. I always know that if in a pinch like after a sad film or just your average mid morning meltdown, I can use it for my entire face and you would never know! It really has been tried and tested! A little later to the game than the rest, but nevertheless loved, have been the Barry M Gelly Hi-Shine Nail Paints. I am not usually very bothered about my nails but for some reason I have been loving these! Again, I have already reviewed them so I won't go into too much detail. I will quickly say that they come in a really range of beautiful colours and are super shiny and gel-like! Although not the smoothest application, I usually only need one coat and they are very chip resistant. Overall a great product! In terms of skincare, this month, I have been a little limited. My skin had been very aggravated, so I have been trying to use only what is gentle or necessary on skin. I have though, been using my DIY Honey Face Mask Recipe every day. This mask has been amazing as it is natural and super gentle. I use it every morning as a cleanser and not only does it cleanse amazingly but it also keeps skin soft and moisturised. I also have two favourite hair products this month and both happen to be conditioners. The first is the Palmer's Olive Oil Co-wash Cleansing Conditioner. It is very nourishing but also does a great job at cleansing. What I particularly love about it is that it contains peppermint oil, which leaves the scalp feeling really refreshed and smells amazing. I have also been using the Loreal EverSleek Smoothing and Nourish Conditioner, it is great at preventing frizz and smoothing hair whilst still conditioning well. As it is silicone free it doesn't weigh hair down and is CG friendly! It also has a lovely smell and actually works great as a leave in. Have you tried any of my monthly favourites! I almost got the Palmer's cleansing conditioner, but wasn't sure how good it actually is and you made me want to try it so bad!